Hi! So, I made the announcement about my acceptance to grad school on my personal blog, That Artsy Reader Girl, back in May and thought I'd mention it here as well! I got into Valdosta State University's library and information science online grad school program! I actually left home yesterday, and am currently driving to Georgia for orientation. My mom is with me, and after orientation we're driving down to Florida for a 4-day cruise before I head home to start school. I've started a new feature on my blog called That Artsy Librarian, and I will discuss the program as I go through it. I'm pretty excited! Anyway, since I'm road tripping it to Georgia I'll be gone 16 days total, and will have a TON of time to read. I've put together a vacation to-read list, and thought it would be fun to tell you what I'm reading and a make the trek across the USA. Also, I want your recommendations for light summer reading! I will have my computer with me, so I can buy all the good stuff on Amazon Kindle as I go. I'd love some road trip books as well! Just throw out your thoughts, and let me know if I've made good choices so far! I got an ARC from Macmillan a while back, and have not had the time to read it yet! I've heard it's darling, so I'm making it my top priority. In Famous Last Words by Jennifer Salvato Doktorski, sixteen-year-old Samantha D’Angelo has death on the brain. Her summer internship at the local newspaper has her writing obituaries instead of soaking up the sun at the beach. Between Shelby, Sam’s boy-crazy best friend; her boss Harry, a true-blue newspaper man; and AJ, her fellow “intern scum” (aka the cute drummer for a band called Love Gas), Sam has her hands full. But once she figures out what—or who—is the best part of her summer, will she mess it all up? 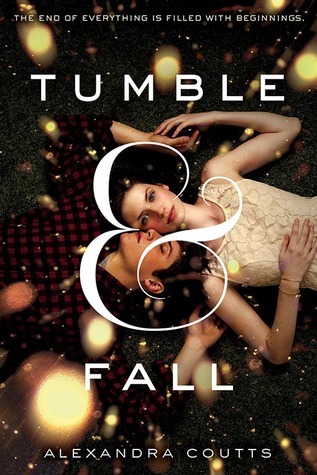 I love the idea of a pre-apocalyptic novel, and was so excited when I got an ARC for Tumble and Fall! What would you do if you knew the world was ending in a week? The world is living in the shadow of oncoming disaster. An asteroid is set to strike the earth in just one week’s time; catastrophe is unavoidable. The question isn’t how to save the world—the question is, what to do with the time that's left? Against this stark backdrop, three island teens wrestle with intertwining stories of love, friendship and family—all with the ultimate stakes at hand. We've all heard the hype! 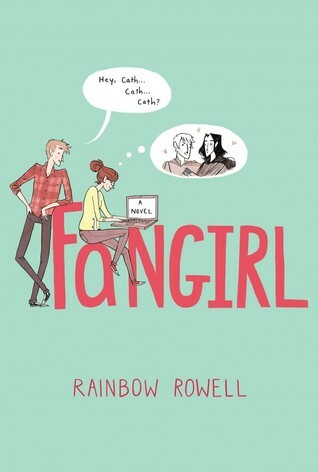 I am SO excited to read a Rainbow Rowell book! Fangirl will be my first. The title alone has me excited! I am beyond excited about this one, guys! Time Between Us was one my top 3 reads of 2012, and I was left wanting more of those characters so badly. I'm all over this. Calling Anna and Bennett’s romance long distance is an understatement: she’s from 1995 Chicago and he’s a time traveler from 2012 San Francisco. The two of them never should have met, but they did. They fell in love, even though they knew they shouldn't. And they found a way to stay together, against all odds. It’s not a perfect arrangement, though, with Bennett unable to stay in the past for more than brief visits, skipping out on big chunks of his present in order to be with Anna in hers. They each are confident that they’ll find a way to make things work...until Bennett witnesses a single event he never should have seen (and certainly never expected to). Will the decisions he makes from that point on cement a future he doesn't want? 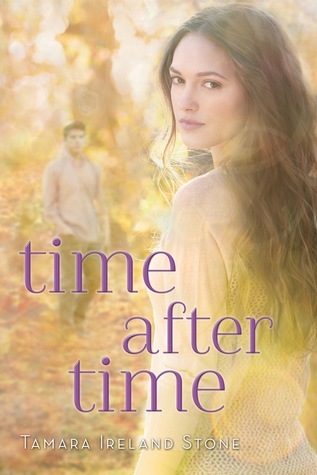 Told from Bennett’s point of view, Time After Time will satisfy readers looking for a fresh, exciting, and beautifully-written love story, both those who are eager to find out what’s next for Time Between Us's Anna and Bennett and those discovering their story for the first time. I read Heist Society on my cruise this past May, and adored it! I can't wait to read the next one! Katarina Bishop has worn a lot of labels in her short life. Friend. Niece. Daughter. Thief. But for the last two months she’s simply been known as the girl who ran the crew that robbed the greatest museum in the world. That’s why Kat isn’t surprised when she’s asked to steal the infamous Cleopatra Emerald so it can be returned to its rightful owners. There are only three problems. First, the gem hasn’t been seen in public in thirty years. Second, since the fall of the Egyptian empire and the suicide of Cleopatra, no one who holds the emerald keeps it for long, and in Kat’s world, history almost always repeats itself. But it’s the third problem that makes Kat’s crew the most nervous and that is simply… the emerald is cursed. Kat might be in way over her head, but she’s not going down without a fight. After all she has her best friend—the gorgeous Hale—and the rest of her crew with her as they chase the Cleopatra around the globe, dodging curses, realizing that the same tricks and cons her family has used for centuries are useless this time. What do you think? Have any additional recommendations I need to get on my Kindle? Wish me safe travels as I continue my road trip! And if you're living anywhere between Utah and Florida, wave towards the nearest interstate/freeway! I can't wait for your new feature! It'll be interesting reading about somebody's experience as I prepare to apply to library science programs. I'm really excited about Fangirl. Sooo jealous of everybody who has read it. I have to wait until it comes out to get my hands on it. I like the sound of Famous Last Words. Then again, I'm a journalist, and I love cute novels and films set in the world of journalism (even if they are completely unrealistic). I hope your road trip is fun. And YAY ROAD TRIP! I hope you have so much fun with your mom and see lots of beautiful things and have a nice relaxing cruise! I can't believe you have Time After Time! I'm so jealous. The Heist Society series is amazing, so Uncommon Criminals is a good choice. I read Famous Last Words recently, and it's really good. Congrats! I love being a librarian and my program was half online. One of my very favorite people just got a tenure-track job at Valdosta State, so I went down to see her last month. Look up Elliano's if you like coffee, it's a drive thru place with delicious frozen drinks. Also look for a bookstore called dorks, just for fun. Definitely come prepared for afternoon downpour! Congratulations on getting into grad school. I'll be applying for grad school myself in a few months and I'm a nervous wreck about the entire thing. I'm trying to stay positive and pray everything works out the way I want it to. You've got some good reads there. I'm reading A Beautiful Truth by Colin McAdam. It comes out in September so I've got an unedited ARC, but it's an amazing, beautiful read so far. Congratulations!! :) Fangirl sounds amazing, of course, and so does Famous Last Words. When does it come out? 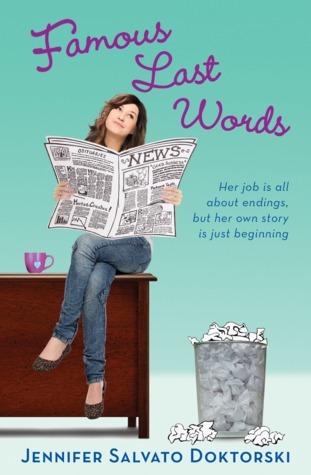 Famous Last Words came out in June, and Fangirl comes out in September!